I can't even remember where I saw the article above, (obviously a climbing mag! ), but it pretty much says it all - no strong fingers, means no strong routes. It's a no-brainer but I forget it once in a while. I'm more of an endurance sports person so always get sucked into doing routes - lots of routes. But I keep hitting invisible barriers, and more often than not, it's cause I don't have the strength/power. Yeah, my fingers are relatively strong, but can I hang one-armed from a crimp - barely as it turns out. A 2-finger pocket - used to be, not so easily anymore? The strongest people can (and more - this guy doesn't look like a climber!). I'm hardly the most qualified person to comment, but for what its worth I agree. Fingers fingers fingers all the way, doesn't matter how strong you are if you can't hang the hold. 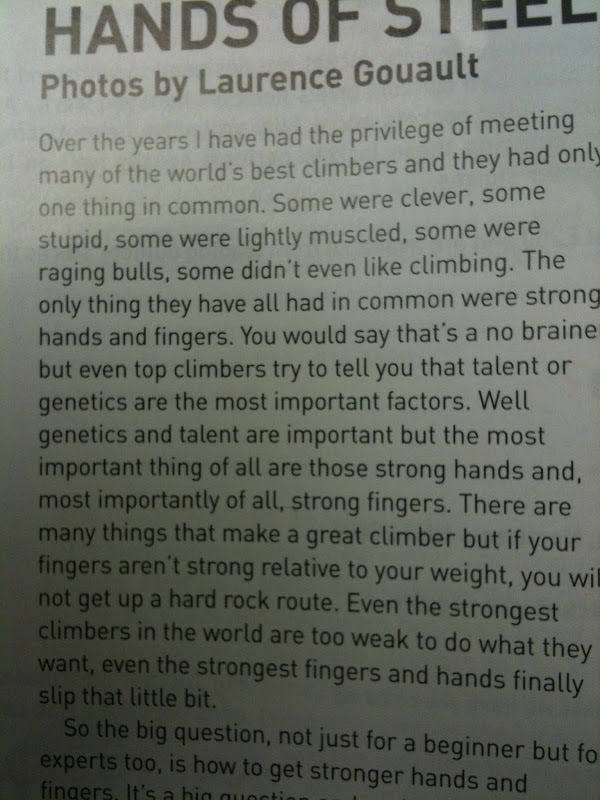 Of course being strong in the body will be beneficial too (as I've found from being forced to go to the gym more in the north), but I think it was Malcolm Smith who said something like "Some of the top climbers get away with having weak bodies, but none get away with having weak fingers!"